In this post: Picture books for the youngest generation of upstanders and civil rights activists. I’m afraid my children will grow up to be bullies. I’m afraid they will grow up to be victims. Most of all, I’m afraid they will grow up to be passive. Learning to stop victimizing someone is difficult, but it’s education and compassion – no courage needed. Learning to stand up against bullies requires courage, but it’s an act of necessity, of self-preservation. Humans are pretty skilled at that. The choice to stand up when we see someone ELSE getting picked on though, to stand up to our friends and risk getting ostracized and placing ourselves in harm’s way – that’s a new kind of courage I don’t know how to teach. We’ve gone over scripts on what to say when a classmate attacks my kids, but explaining to them when and how to stick up for someone else against our own friends is a tougher conversation. Noni Speaks Up connected with Q in a way our previous conversations and books about bullying never did. It validates the fear he has – but wasn’t able to put words to. He knew he SHOULD stand up to his friends when they say something he knows is wrong, but didn’t know WHY it was so hard to assert himself in these situations. Not until we read this book and saw Noni’s reservations and decisions to stay quiet or speak up illustrated. When you’re afraid to speak up about problematic behavior because you might lose friends, family, or business – that’s a sign. When it feels like you are making a big deal out of nothing – that’s a sign. When you’re shaking your head that no one else has has stepped up – that’s a sign. When you can stay quiet and no one would notice – that’s a sign. When someone who has spoken up is getting piled on and you think ‘Whew, glad that wasn’t me!‘ – that’s a sign. When you’d rather run screaming in another direction than enter the arena – that’s a sign. When you’re worried you’re going to get judged or face backlash for speaking up – that’s a confirmation. 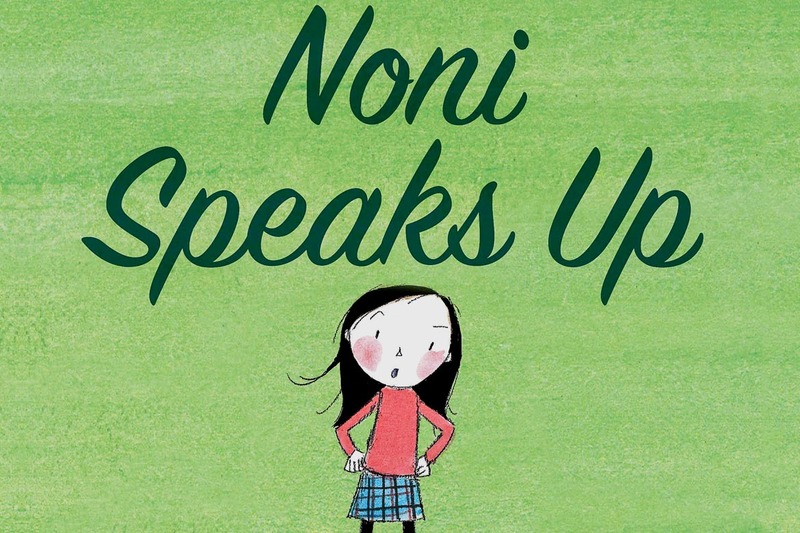 Noni Speaks Up – Shows kids that the fear of being rejected by our own friends is normal, but important to push through. The Smallest Girl In the Smallest Grade shows us that even when we feel small and powerless, we can ignite change. The Araboolies of Liberty Street shows us how a neighborhood can unite against a tyrant. When A Bully Is President – A more didactic book for older kids to be used as a tool in understanding how to resist authoritarian regimes. In ‘I Am Jackie Robinson,’ we learn about the fear and bravery it takes to break race boundaries. ‘The William Hoy Story‘ showed us how players with disabilities (Hoy was Deaf) can inspire league-wide disability accommodations that help every player. ‘Miss Mary Reporting‘ isn’t technically on the field – but this biography of sportswriter Mary Garber shows how tenacity and passing sustained Garber as she broke into a domain that was openly hostile to women. ‘Amy, The Story of a Deaf Child‘ isn’t a story specifically about disruption, but it normalizes day-in-the-life of disability-rights advocate Amy Rowley. Behind the book, Amy fought for disability accommodations for equal education in the 1979 case of Board of Education […] v. Rowley case, which she lost – but it inspired more disabled students to keep fighting. ‘Separate is Never Equal‘ is the story of Sylvia Mendez, who fought for the right to attend a white-only school in 1946. The success of her case laid the groundwork for desegregation fights across the country. 14 years later, in ‘The Story of Ruby Bridges,’ we see six-year-old ruby endure threats, harassment, and organized strikes against her attendance in a formerly white-only school. ‘Ron’s Big Mission‘ is based on the story of astronaut Ron MacNair in his 1959 fight for the right to check books out of the library. ‘The Library Lion‘ has been the single most effective book in discussing when it’s okay to break the rules – and what it means to sacrifice our comfort and happiness for the safety of others. Please don’t send me more studies explaining how kids are more likely to emulate human protagonists. All of them fail to account for the effects of expanded discussion. Both my 3yo and 5yo found the lion’s choice to be bittersweet and uplifting – and were able to equate times in their own lives when they might be called on to do the same during our guided discussions. If you liked ‘The Book With No Pictures,’ you’ll love ‘This is My Book,’ a silly story breaking the 4th wall. Pett provokes readers to recognize the translation from an artist or author’s intentions, and how that morphs once a reader creates a relationship with a story. The story inspires readers to break the rules, so search for a new (rather than used) version of this book – you’re likely to find rips and scribbles throughout the pages if previous readers connected with the story. There’s also a fragile pop-up on one page, so reading requires adult supervision for kids under 4. ‘On Our Way to Oyster Bay‘ is told from the perspective of 8-year-old Aidan, who worked 72-hour work-weeks until real-life child-rights activist Mother Jones organized a 100-mile, 16-day march of children that eventually resulted in safer child labor laws. ‘Brave Girl,’ is the story of Jewish-Ukranian immigrant Clara Lemlich leading the massive Uprising of 20,000 in 1909, leading to a revolution in working women’s rights. ‘Little Leaders’ features 40 Black women who changed the world with exceptional work in literature, art, space exploration, and beyond. ‘I Dissent‘ is the story of Ruth Bader Ginsburg as she refuses to accept the bigotry she faced growing up and as a Jewish woman fighting for justice and equality in the US Supreme Court. ‘Jacob’s New Dress‘ is the story of a little boy determined to dress himself the way he feels powerful – despite bullying, gender norms, and his parents’ hesitations. ‘Bad Girls‘ is a bit bloody for littles (Beheadings! Revenge! Pirate Queens!) but soooo good it should be in every parent’s lexicon – and it also makes the perfect Mother’s Day Gift…if you happen to be the father of my children ::cough cough::. ‘Malala’s Magic Pencil‘ is Malala Yousefzai’s fairytale-esque autobiography about her decision to take responsibility for the inequity around her using the only tools she had as a young girl – words. Phoebe’s Revolt is the story of one little girl determined to cast off the oppressive ruffles of constrictive frilly dresses. Caveat: toes the line on ‘not like the other girls’ tropes, but Phoebe’s hostility to her Prissy cousin’s propriety is more a reaction to Phoebe’s parental comparison and pressure than hostility toward other women. So I am okay with it. There are so many historical inaccuracies in this biography of Victoria Woodhull it’s basically historical fiction, but it’s nice to have a kids’ book on this hallmark figure of women’s history to open discussions on gender and politics with kids. In ‘The Other Side,’ we watch Clover and her white neighbor on the other side of the fence push boundaries (literally) despite their parents instructions to stay apart. ‘If You Plant A Seed‘ is an allegorical tale of exploring feelings of scarcity and greed, then sharing and reciprocity and the resulting abundance – in a collaboration of adorable animals. ‘Yertle the Turtle‘ is a classic story of a tyrants and the subversive, small protest that caused his downfall. Caveat – Many of Dr. Seuss’s books were racist and problematic, and you can get a better understanding of how to discuss Dr. Seuss’s stories at Pragmatic Mom. Miss Paul And The President shows the unique and innovative ways Alice Paul caught the attention of the President in the suffragist movement for white women’s right to vote. From my cursory (re: brief and poorly-vetted) research, Paul was a typical white suffragist – meaning she didn’t do squat for women of color, and actively discouraged women of color and Jews from attending the marches she organized. It’s worth noting that this book is illustrated by a woman with a Chinese last name – we Chinese ladies weren’t allowed to vote until much, much, much later than white ladies and Alice Paul was totally cool with that. Nelson Mandela is a beautiful, albeit not particularly engaging book. Either way – it gives kids a brief history of South Africa’s apartheid and Mandela’s decisions to ignore unjust laws in the pursuit of racial justice. Deborah Menkart has a negative review of this book worth noting on the over-simplification of apartheid and the mything of Nelson Mandela worth check out here. I’m keeping it in because for the age ranges we focus on in BFL, we need to simplify things, and I’m relying on readers to use these books as a launchpad for further research and discussion, not as the final truth. I Am Gandhi – as a problematic role model for misogyny and sexual abuse, this age-appropriate book cherry-picks the good stuff Gandhi did. Not saying we should ignore his flaws, but for preschoolers, this is an inspirational story. He’s not perfect – but this book teaches kids what they need to know until they’re old enough to dive into the violence caused by history’s idols. ‘I am Rosa Parks‘ is self-explanatory, and ‘Imogene’s Last Stand‘ is a fictional story of a feisty little girl who takes lessons from American history to protect what she believes in. Subscribe at the top of the page for email updates when we create more posts like this – or become a BFL patron and get exclusive content not available anywhere else. Awesome post. I think I recently added to my “to read” list a book about a girl who fights to be on the boys softball team bc she’s awesome. If I can find it I’ll pass it along. Might be good for your third sports slot. Ooh! Excited to read that one! Let me know when you find it. Thanks for this! Any thoughts on Super Manny Stands Up? It’s pretty simple, but my son loved it as a 3-year-old, and it seemed to help him navigate some difficult situations with other kids at preschool. I LOVE Super Manny Stands Up! We even include the sequel, Super Manny Cleans up in the Collective Action post. Awesome, I’ll definitely check out Super Manny Cleans Up too. Thanks!